When your cruise ship docks in the Dublin port, embark on this City Sightseeing hop-on hop-off shore excursion and discover Dublin’s historic buildings, museums and more! Enjoy the comfortable seats and top deck of the open-top minibus as you tour around the city and explore at your own pace. Listen to the informative onboard audio guide and hop off at any of the 20 stops whenever you want! Create your own itinerary and decide what sights you want to see, when you want to see them. A City Sightseeing hop-on hop-off bus tour is the perfect sightseeing shore excursion while you’re in port in Dublin. Enjoy great views from the top of the bus and see top Dublin attractions as you tour around the city. 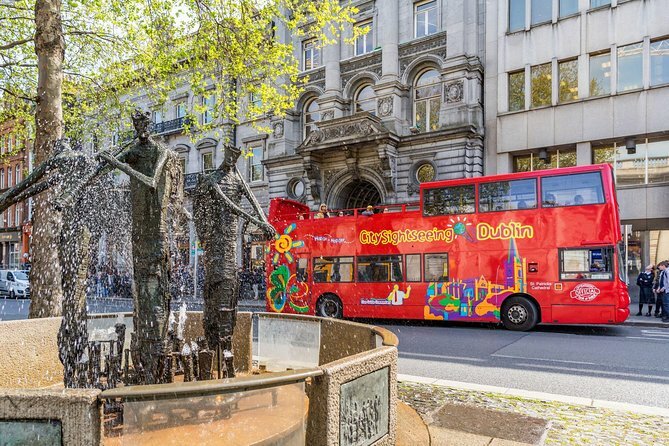 Board the open-top, double-decker bus and see several of Dublin's major attractions including Dublinia, a great interactive exhibition of Irish history and culture. Visit the Old Jameson Distillery, the historic Dublin Castle, the Dublin Zoo in Phoenix Park and, of course, the famous Guinness Storehouse. Enjoy the informative audio commentary and hop on and off as many times as you like at any of the stops around the city. Your ticket is valid for 24 or 48 hours after the first use (depending on option selected at booking). This excursion is located within a 20-minute walk to the cruise port, so you determine the time you return to your ship in Dublin. Please allow yourself ample time to enjoy the excursion and ensure your timely return to the port. This excursion is not covered by our worry-free policy. Cruise Passengers: Shuttle services are available to take cruise passengers from the terminal into the city centre. These shuttle services arrive nearby Merrion Square - close-by to tour stops 5 & 6 along both routes. Please note, these shuttle services are not operated by City Sightseeing and may incur extra charges. Passengers can also opt to walk to Stop 1, 13 Upper O'Connell Street, which is roughly a 20-minute walk from the Cruise Terminal. This tour operates a circular route - it will return to the first departure point. Cruise passengers are advised to return to Stop 5 or 6, at Merrion Square, where shuttle services operate to return passengers to the Cruise Terminal.